Since the process of exchanging ICN tokens for ETH is straightforward, the focus of this blog post will be on the process of exchanging ICN for eICN. To help you decide whether to exchange your ICN tokens for eICN tokens, we will explain the predicted path to the eICN security token as our final goal. 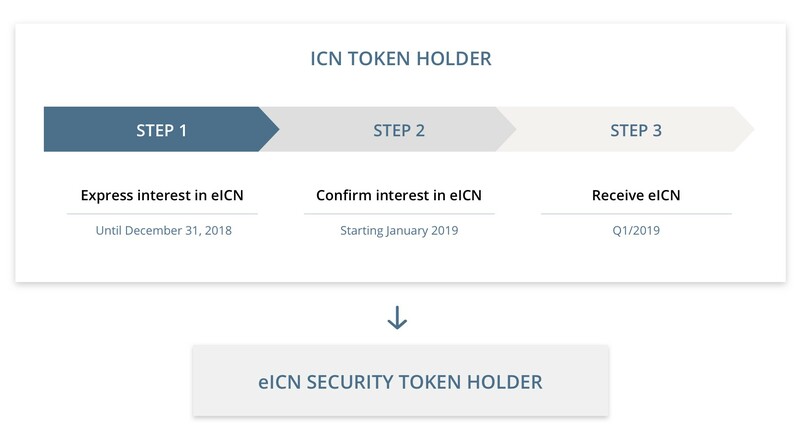 On the basis of recent developments in the ICONOMI transformation process, we have found a way to transform ICN tokens into eICN security tokens without the intermediate step of issuing ICONOMI AG shares to ICN holders. This will make the process quicker and easier both for ICONOMI and for ICN holders. The exchange of ICN tokens for eICN security tokens will happen in several steps. The first two steps must be made by ICN token holders themselves if they want to exchange ICN for eICN. After these two steps, no further action will be required. In the third step, ICONOMI AG will issue eICN security tokens as tokenized securities. All holders of eICN will be entitled to common shareholders’ rights such as voting rights and the right to participate in the net profit of the company. By exercising their rights, eICN holders will shape the future of ICONOMI. The listing of eICN security tokens will occur as soon as security token exchanges become operative, while OTC transactions will be possible as soon as the eICN tokens are issued. Note: The process above presents the timetable for ICN holders who start the process by December 31, 2018. For other ICN holders, additional rounds of the process will also be offered in 2019. After December 31, 2019, exchange of ICN tokens will no longer be possible. Since the very beginning of ICONOMI, we were determined to push the bar in the blockchain industry and constantly set new standards in this emerging world we see so much potential in. This journey requires a great deal of commitment on our behalf, of course, but also from those who have joined us along the way. We strongly believe that with this process of transformation and the issuance of eICN, we are taking the next big step on our path to offering all the legal clarity and certainty possible under the current legal framework. More detailed information regarding the process (step 2 and step 3) will be published in a timely manner, and will certainly be published before the offering of eICN. Read our FAQ Part I, Part II, and Part III and visit our Help Center to find answers to your questions. If you still have questions, contact our customer support team.